Sunday’s celebrations herald the Order of Khalsa, which includes a Sikh code of conduct that dates to 1699. 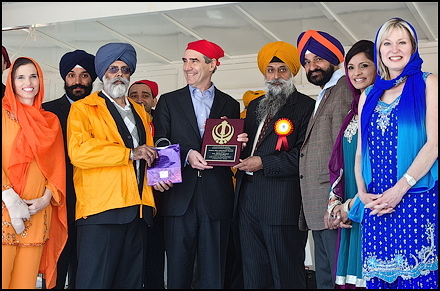 Ignatieff said he wanted to make sure the victims and survivors of the 1984 massacre of Sikhs in India were properly honoured. The killings — called a genocide by the Sikhs— occurred after the assassination of Indira Ghandi. According to some human rights groups, somewhere between 10,000 and 17,000 Sikhs were killed. Layton also made promises to a community that’s pushing to get the 1984 attacks categorized as “genocide” in Parliament. They say 100,000 people will march in Ottawa on November 1, the anniversary of the beginning of the murders in India. Michael Ignatieff with Sikh community officials and others at Queen's Park. Conservative Leader Stephen Harper was in Burnaby, B.C., on Easter Sunday. He attended Vaisakhi Day, another major Sikh celebration, in Vancouver last week. The campaign enters its final week on Monday prior to the May 2 general election. Thanks to Julia for the pics!